The Bernard-Hoover Boathouse is historically significant as the last remaining building of the commercial boating business in Madison. It serves a reminder of the time when vacationing tourist and local residents were using the lakes for travel and recreational outings to resorts, which once dotted the shore. 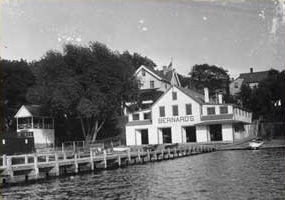 From 1855 to 1968, the Bernard-Hoover was both the first and the last major commercial boating business in Madison, located at 622 East Gorham Street. Commercial operations of the business included; boat liveries (boats for rent for pleasure and fishing), boat builders, and steamboat operators. The steamboats, one of the most impressive parts of Madison’s navigational history, were used to ferry local residents and tourist to various picnic spots or pleasure parks along the shore lines. There were about 20 such enterprises on Lake Mendota during the period before World War II (8 boat builders, 13 liveries, and 6 steamboat operators), but they were in general much shorter-lived than their Lake Monona counterparts. On Lake Mendota, the commercial boating operations were located on the street ends of North Franklin, North Blair and North Blount Streets. The most well-known launch sites were Angle Worm Station (at the foot of South Carroll Street), a station located at South Blair Street, and a station located at South Hancock Street. All buildings and piers associated with these operations no longer exist, with Bernard-Hoover Boathouse being the last remaining reminder of the past. Charles Bernard was born in Baden, Germany in 1824. At eight years old, he immigrated to the United States with his family. Before arriving to Madison in 1853, Bernard served as a member of the United States Marine Band as a ship’s carpenter in Brooklyn, New York, a soldier in the Mexican-American War, and a tailor in Lancaster County, Pennsylvania. When he moved to Madison, he continued working as a tailor and fisherman. In 1855, he bought the property at 622 East Gorham Street for a fishing station, although he continued to list himself as a tailor in city directories. His boating business was well established by 1875 and the city directory listed under his name “Charles Bernard Boat Delivery, First Class Pleasure and Fishing Boats and Fishing Material to Let, Landing Near Woolen Mill on Fourth Lake.” In 1890, Bernard built his first steamboat, which he named after one of his daughters, followed by another steamboat named the Columbia in 1893 and the Wisconsin in 1905. Charles Bernard died in 1907, and his son William took over the business. Around the same time, the family bought land at Woodward’s Grove on the northeastern shore of Lake Mendota and opened Bernard’s Pleasure Park featuring picnic grounds, a refreshment stand, swings, and large dancing pavilion. The Bernard steamers offered two hour excursions around the lake or trips across the lake to the park. At the peak of the business, Bernard’s operated six large pleasure boats at a time. 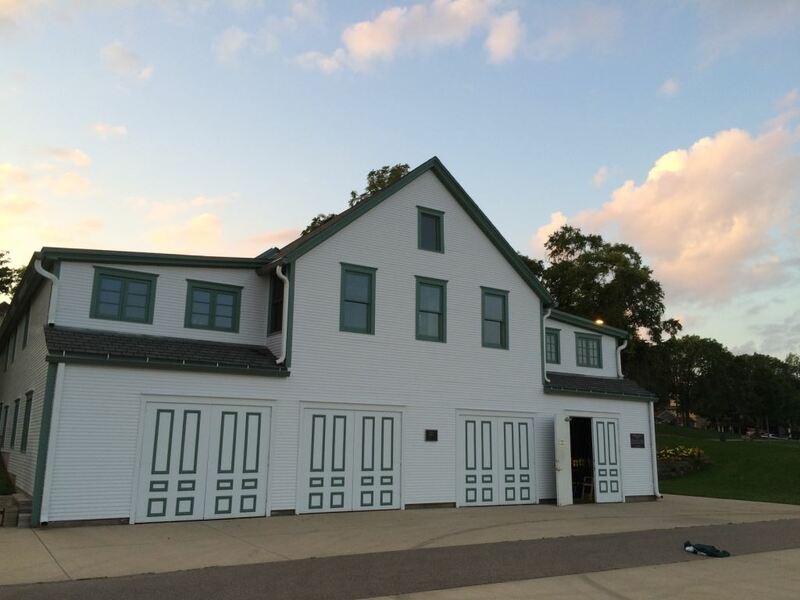 In 1911, the original Bernard boathouse was replaced by a spacious new building. Four years later the new structure was destroyed by fire, but it was quickly rebuilt with the same design. By 1940, the automobile had cut down substantially on the commercial boating business in Madison causing William Bernard to sell the boathouse, boats, and docks to Berg’s Sporting Company. In 1943, the Bergs sold the property to Harry Hoover, who continued the business until 1968 when the City of Madison bought it as part of its plans to expand James Madison Park. Currently, Bernard-Hoover Boathouse is use by the Mendota Rowing Club.